One of the most characteristic features of orchids is their seeds, which are much smaller and more numerous than those of most (perhaps all) other plants. Orchid seeds usually have a loose, papery coat surrounding a small embryo, and are often spindle-shaped. The orchid embryo is not differentiated into distinct organs, as is the case with many other plants. Only after the seed germinates do the cells begin to differentiate into root cells, leaf cells etc. Orchid seeds, unlike those of other plants, contain no food source to sustain the growing plants. Therefore, in nature they require the presence of mycorrhizal fungi, usually associated with other plants, to manufacture and provide the nutrients necessary for the growth of the germinated orchid seed. The chances of a seed encountering both a favourable environment and the appropriate mycorrhizal fungus for it to germinate and grow are very low. Nature evens the balance by endowing orchids with the capacity to produce a large number of seeds; many orchid seed capsules contain at least a thousand seeds, and some contain millions. For many years the best way known to raise orchid seed was to sprinkle it in the pot containing one of its parent plants, because this potting mix was the best source of the correct mycorrhizal fungus to promote growth of the seedlings. Even then, few seedlings germinated and survived to flowering size, and consequently orchid seedlings were expensive. But in 1922 the American scientist Lewis Knudson developed the method of ‘flasking’, by which orchid seed was raised in a sterile, nutrient-rich gel without any need for mycorrhizal fungi. This method made it possible to raise orchid seedlings in almost unlimited numbers, and they have consequently been available at reasonable cost ever since. In Nature, most orchid seed is dispersed by the wind. The flower stems of some terrestrial orchids elongate after pollination, so that the seed capsule is raised above the surrounding grasses, and the seed is therefore capable of being dispersed more widely by the wind. Most seed probably settles only a few metres from the parent plant but some seeds, because they are so small and light, may be blown long distances. Some Australian terrestrial orchids have been found in the wild in New Zealand, and it is very likely that these arose from seed carried there from Australia by the prevailing westerly wind. Scientific studies on the Indonesian island of Krakatoa provide striking evidence for the aerial transport of orchid seed over long distances. Well over a century ago (in 1883) an enormous volcanic explosion that it was heard in northern Australia and the resultant dust cloud circled the earth! Yet 13 years later three orchid species had re-established themselves, and 50 years later there were 35 destroyed all plant and animal life on Krakatoa. The explosion was so loud different orchid species, despite the fact that the nearest land (the island of Java) was 40 Km away! All 35 species must have arisen from seed blown from Java or even more distant islands. 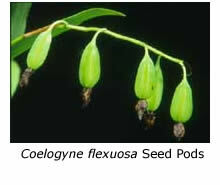 Have you tried pollinating orchid flowers, and then watched the seed capsules develop? The principle is the same for all orchids but it’s easier to carry out with those genera with large flowers. Simply break off the pollen cap with a toothpick, remove the pollinia from the pollen cap and transfer one or more of them to the stigma (the sticky cavity a little below the pollen cap). Experiment with a picked flower until you get the knack. 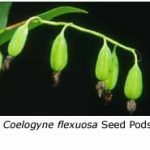 Your chances of getting a seed capsule that will grow to maturity will be improved if you take the pollinia from one plant (the pollen parent) and transfer them to the stigma of another flower of the same genus (the pod parent). You may need to experiment with a number of different pollen and pod parents before you find a combination that will produce a seed capsule that grows to maturity. If you’re using cymbidiums, prepare for a long wait, as the seed capsules will take about nine months to mature. Don’t pollinate the flowers on those plants you intend to exhibit, as orchid judges disqualify inflorescences with pollinated flowers or missing pollen caps. Disas are more suitable for impatient hybridisers like me. The pollinia are very large, and are attached to a sticky disc (called a viscidium), so it’s easy to remove them. Also, the stigma is fully exposed for all to see, unlike that of many other orchids. Best of all, the seed capsules grow at an incredible rate, and mature in only six weeks. The seed capsules of Australian native dendrobiums are intermediate between those of cymbidiums and disas, in that they usually mature in three or four months. Even if you have no intention of raising the resultant seed, it’s an interesting experience to watch the seed capsules mature and to marvel at the small size of the resultant seed. Give it a go, it’s fun.